The united pro-Azaadi camp in Jammu & Kashmir has come up with its 10-point resolution, which according to two factions of the All Parties Hurriyat Conference (APHC) and Jammu & Kashmir Liberation Front (JKLF), has received endorsement of thousands of people on 1 July across the restive Himalayan valley. After unprecedented restrictions imposed on movement and activities of the resistance leaders in the Kashmir Valley under the Peoples Democratic Party (PDP)-Bharatiya Janata Party (BJP) rule since March 2015, the pro-Azaadi camp finally got to enjoy some respite this Ramzan. Not very long ago, Syed Ali Geelani-led pro-Pakistan faction of the APHC held a seminar at its Hyderpora headquarters. Also Read: Why is Mehbooba cracking down on the pro-Azaadi camp? During Ramzan, various Hurriyat leaders and their representatives addressed Friday congregations and the pro-independence JKLF organised a grand Iftar party on 2 July to send out a message of communal harmony by inviting many members of the minority community as well. Moderate estimates put the number of participants at the JKLF Iftar party at 4,000. Moreover, the Shab-e-Qadr sermon of Mirwaiz Umar Farooq in Srinagar's historic Jama Masjid was streamed live on the Internet for Kashmir's diaspora on the intervening night of 2 and 3 July. On Hurriyat's official Facebook page there were more than 10,000 views and a barrage of emotional comments, mostly from non-resident Kashmiris settled in the Middle East, Europe, UK and USA. The Hurriyat led by Mirwaiz Umar claimed that its information technology team had made elaborate arrangements for the live streaming of the Shab-e-Qadr sermon and night long prayers. On the last Friday of the holy month of Ramzan, which is also referred to as Juma't-ul-Vida and is observed as Youm-e-Quds (in memory of Al-Aqsa mosque), many pro-freedom leaders addressed Friday assemblies with an aim to get its 10-point resolution endorsed by the Kashmiri people. So what is this new 10-point resolution all about? The resolution, while seeking the attention of the international community and Organisation of Islamic Cooperation (OIC), stresses on "resolving Kashmir as per the wishes and aspirations of the people". The united Hurriyat camp says that the resolution was presented before the people in all central mosques (Jama Masjids), Khanqahs, Imam Baras and shrines across Kashmir for approval. The first point of the resolution says in unambiguous language that "Jammu and Kashmir is a disputed region, which is a reality for which finding a peaceful, long-lasting and acceptable solution as per the wishes and aspirations of the people and keeping their sacrifices in mind is an essential need of the times". The third point vociferously opposes "the settlement of displaced Kashmiri Pandits in separate townships and setting up of colonies for retired Sainiks (troops)". It also resolves to fight any move tooth and nail which is aimed at snatching and "weakening" Kashmir's "political, economic, religious, and social rights". The resolution seeks to oppose what it describes as "anti-Kashmir policies and plans of RSS (Rashtriya Swayamsevak Sangh) and its local collaborators to alter the demography" of the Muslim-majority Jammu & Kashmir region. Besides, the united pro-Azaadi camp demands "imposition of ban on the sale and consumption of liquor and narcotics drugs" in Jammu & Kashmir and has criticised the PDP-BJP government's stand on this issue. Apart from the larger political Kashmir question, the resolution also talks about various socio-religious issues with an aim to challenge the PDP-BJP coalition government on several fronts. Point six of the 10-point resolution strongly deplores the alleged crackdown on Kashmir's clergy and describes "profiling and surveillance of the Imams" as "religious interference". A recent news report in a Srinagar-based English daily had mentioned that "profiling and surveillance" of the Imams in Kashmir was being done to analyse what they say in their sermons on Fridays. The report caused angst and disquiet among various sections of the Kashmir society, including socio-religious groups and civil society coalitions. Intelligence agencies have officially denied that such a proposal is in the offing. However, some believe that this is already happening as part of a particular intelligence agency's "de-radicalisation plan" for Kashmir. Meanwhile, the last point in the resolution demands "immediate release of political prisoners of Kashmir from various jails and detention centres in Jammu and Kashmir and different Indian states ahead of Eid-ul-Fitr". The resolution passed by the unified resistance leadership also registers protest against "the illegal occupation of Masjid Aqsa by Israel". 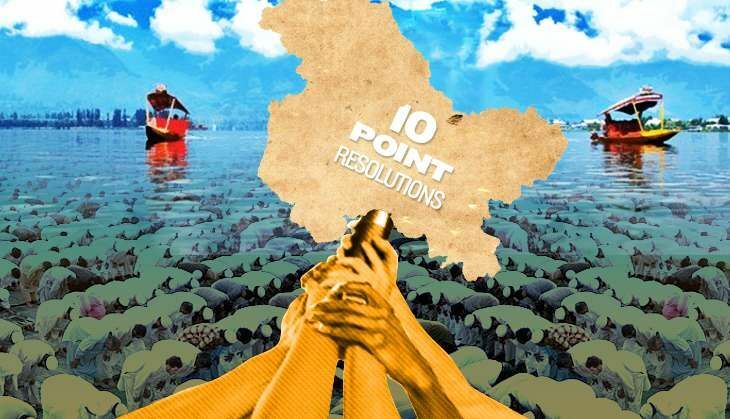 The 10-point resolution from the unified pro-Azaadi camp comes at a time when Jammu and Kashmir's Chief Minister Mehbooba Mufti has made a series of controversial statements on various issues. In Kashmir, some government proposals ,considered controversial, have given birth to apprehensions about the " plans to change the demography of Jammu and Kashmir". Some security and intelligence experts believe that Pakistan has "upped the ante" and directed the Hurriyat factions and JKLF to forge unity. But the JKLF chief, Yasin Malik, while speaking to Catch denied this allegation. "Dialogue is the last hope in any conflict resolution process but it is unfortunate that people of Kashmir have lost faith in the institution of dialogue because of the undemocratic policies of the current PDP-BJP regime," Malik said at his Abi Guzar office in Srinagar. Malik said that India in the past has even talked to military generals of Pakistan and now is shying away from holding a dialogue with a democratically elected government in Pakistan. He insisted that "Kashmir is the principal party to Kashmir dispute". "There can be no solution if public representatives of Jammu and Kashmir are not taken on board and recognised as principal stakeholders," Malik said. It appears that the PDP-led coalition government in Jammu & Kashmir is violating the contours of its own Agenda for Alliance, which one of its top ministers once famously referred to as "sacred document". The government's Agenda for Alliance favours "reconciliation with Pakistan and talks with the Hurriyat Conference". 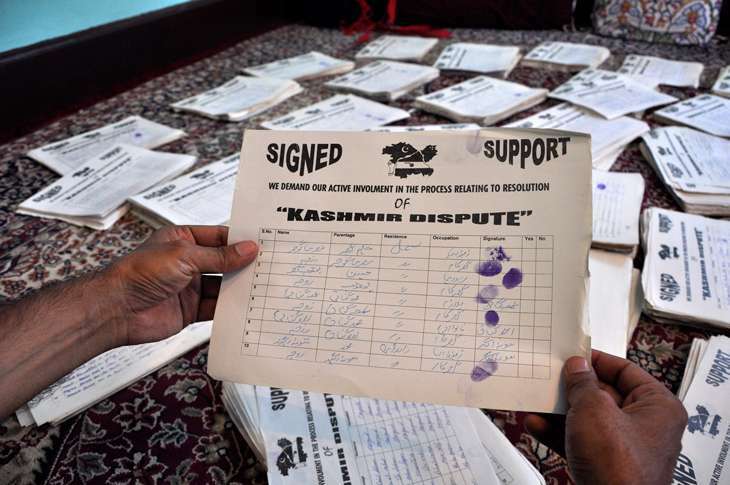 Giving details of his long-drawn-out signature campaign the JKLF chief said that his party collected signatures and thumb impressions of more than 1.5 million Kashmiris who want to be part of the resolution process. "Till date, it is the only transparent democratic exercise that has happened in Jammu & Kashmir. We collected over 1.5 million signatures and thumb impressions of the people by virtue of our signature campaign," Yasin Malik told Catch. In 2003, the JKLF under Malik's leadership launched a massive signature campaign across the length and breadth of Jammu & Kashmir for over three-and-a-half years to ascertain wishes and aspirations of the people regarding the political resolution of the state. Terming his signature campaign as a creative exercise, Malik said that it was a democratic and transparent way to know what the people of Jammu and Kashmir actually want. Malik had presented copies of the signature campaign in a CD to then Indian Prime Minister of India Dr Manmohan Singh and former Pakistan President General (retired) Pervez Musharraf in 2006. "We also sent copies to about 150 embassies," Malik said.